Concerns have been raised over 50 lambs who were stolen from a farm in a raid. The three-week-old Welsh Mule and Texel Suffolk cross lambs were taken from a farm in Hursley, Hampshire, in the early hours of Thursday. 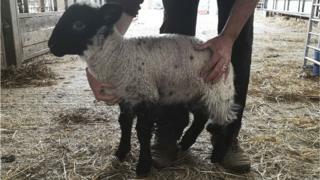 Police said two of the animals died as a result of the raid, and the other lambs are also at risk. The theft would result in the the farmer experiencing "huge financial loss", the force said. An appeal for information has been made. Hampshire Constabulary said it believed the thieves used a vehicle to steal the animals at some point between midnight and 06:00 GMT. PC Steve Rogerson said: "Understandably the farmer is very concerned for the welfare of these animals. "There is a possibility that the ewes could suffer and even die, and other lambs in the field could die as a result of shock. "Those that were stolen are at risk of losing their lives in transit, or from being away from their mothers and not being kept in the right environment." He added that it was "very rare" for thefts such as this to happen in Hampshire.